The predictions and statistics for this week, the M2M Russian Open (European PGA Tour) and the Deutsche Bank Championship (US PGA Tour), are now available on Golf Predictor. As usual, there is a strong field in Boston for the second play-off event, with Rory McIlroy returning to action to join 16 other members of the top 20 in the world rankings, all jockeying for position in the FedEx Cup. As usual, there are no big golf names in action in the Russian event this week. However former tennis grand slam winner Yevgeny Kafelnikov is teeing it up again! Indeed, with not one of the top 150 in the world is taking part and 95 outside the top 500 in the world (52 outside the top 1000), the field strength for this event is very low. Thomas Pieters (ranked 20th by Golf Predictor) won the D+D REAL Czech Masters on the European PGA Tour. The 23 year old Belgian won his maiden tour title by three shots over Pelle Edberg. The big hitting Pieters overcame a double bogey on his front nine to coast home in front of his family, who drove nine hours overnight to cheer him on to victory. Our top ranked player, Victor Dubuisson, finished in tied 27th place and we had eight of the top seventeen plus ties (8/21) in total. Jason Day (ranked 2nd by Golf Predictor) won The Barclays on the US PGA Tour. The 27 year old Australian won his first FedEx Cup play-off event and second big tournament in a row with a brilliant weekend performance. After winning his first major at the US PGA Championship last time out, Day shot an incredible 63-62 over the weekend to blow away the field and win by six shots in New Jersey. Our top ranked player, Jordan Spieth, unexpectedly missed the cut and we had eight of the top sixteen plus ties (8/19) in total. 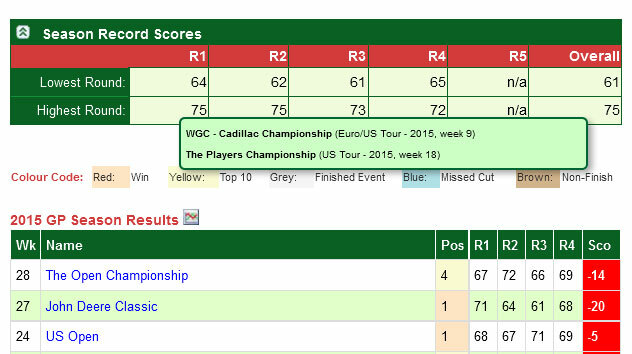 Some minor changes have been made to the listboxes and dropdown boxes on Golf Predictor. As can be seen in the screenshot above of the listbox on Compare Predictions page, these UI (User Interface) elements have been re-styled using Twitter Bootstrap. These means they look a little better than before and are highlighted in blue when selected. The "Stats to Compare" dropdown box shown above is also styled this way, as are all other such UI elements on the site. Just another way to make Golf Predictor a little better! That gives a total of eight field rankings visible on the same page at any one time. With the different historical stats selectable from the dropdown box, there are a total of 24 field rankings available on the page. This dropdown box was introduced to reduce the processing and the size of the web page needed to show them all at the same time! The different data tables each display twelve golfer records per page, but you can use the pager on each one to see more golfers. 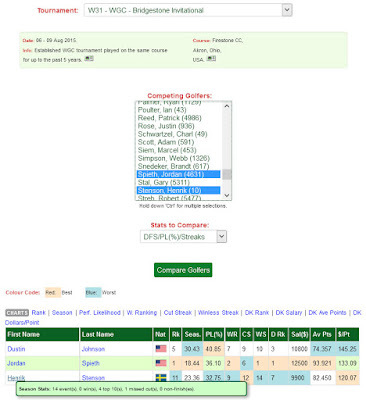 You may have to reload your current Golf Predictor page to see this new 'Field Rankings (Summary)' menu option. Golf Predictor tournament rankings go back to the middle of the 2008 season and some metrics are not available for older events. Keep this in mind if you are perusing old tournaments on this page. As usual, you can hover over a player name for more information, as shown above for Bill Haas for the World Ranking metric. Players with no relevant statistics are omitted from the results on each data table. 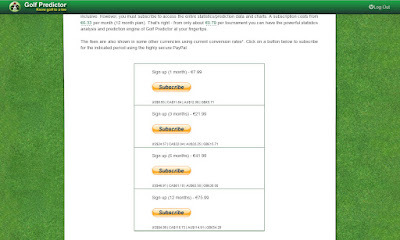 A mixture of partial and full updating is used on the page. Sorting/paging a data table or selecting a new option in the historical stats drop down box will not involve a full page refresh. 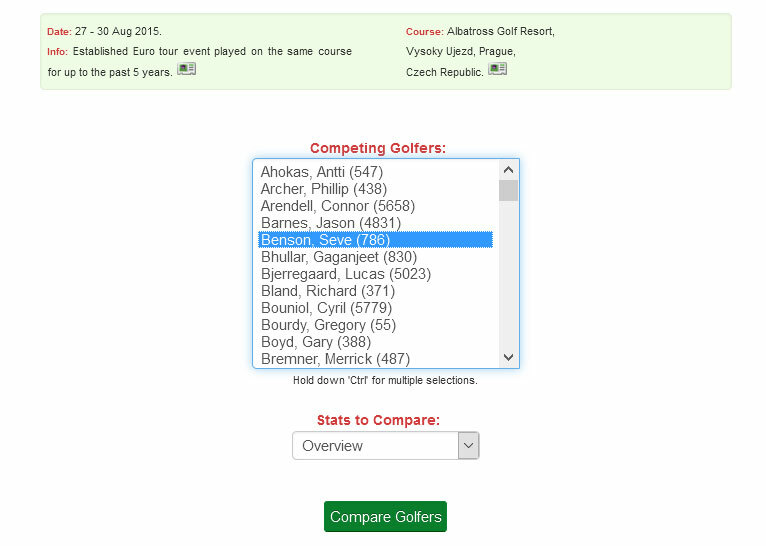 However, changing the tournament or the highlighted golfers will involve a full page refresh. On testing, this proved to be the best scenario. Selecting a new tournament resets the data table sorting, data table paging and the historical stats drop down box to 'GP Season'. It also clears the golfers selected for highlighting. Selecting a new option in the historical stats drop down box resets the sorting and the paging on the four historical data tables. There is a Reset button under the field list which you can use to clear the golfer highlighting. 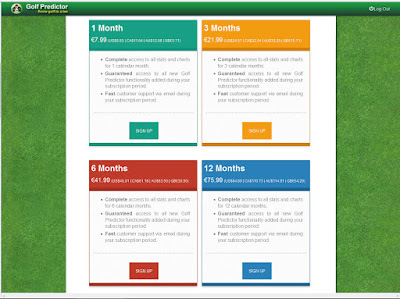 Your chosen golfers may not be on the first page of any data table. They will be highlighted on the page that they appear on (assuming they havea non zero value for the relevant stat). 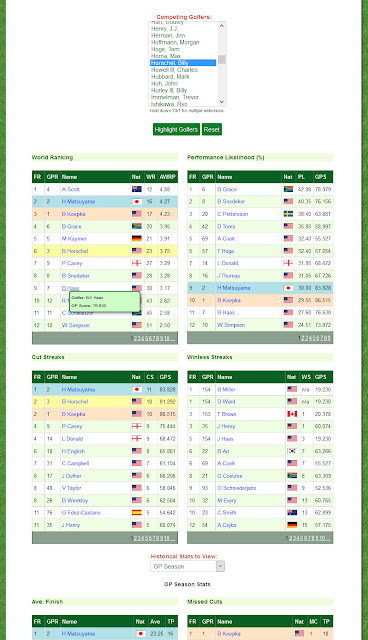 There are a lot of moving parts in this page, between the tournament selection dropdown boxes, the historical stats drop down box, the field list and associated buttons for highlighting and the eight data tables on the page at any one time. I have done a considerable amount of testing, but it is possible I missed something. If you experience any issues, please contact me immediately. I trust you will find this new functionality very useful for your fantasy golf, DFS golf or betting needs. Because this new page is relatively computationally intensive, it is limited to subscribers only. Therefore, sign up today and reap the full benefits of Golf Predictor, the premium professional golf statistics site. The predictions and statistics for this week, the D+D REAL Czech Masters (European PGA Tour) and The Barclays (US PGA Tour), are now available on Golf Predictor. It's the first week of the lucrative FedEx Cup play-offs on the US PGA Tour and although there is no Rory McIlroy, there is still an impressive line up for the event. McIlroy is wisely giving his ankle more time to recover while Sergio Garcia is the only other top fifteen player in the world not teeing it up in New Jersey. Meanwhile, the field in the Czech Republic is not quite as impressive, with only one member of the top fifty (and barely, at that!) in the world playing in Prague. David Horsey (ranked 2nd by Golf Predictor) won the Made in Denmark on the European PGA Tour. The 30 year old Englishman overcame a late hiccup his fourth tour title with a wire to wire victory. Horsey finished with a two over par 73, but that was still enough to win by two shots over a chasing quartet. Our top ranked player, Marc Warren, finished tied 44th and we had six of the top fourteen plus ties (6/19). Davis Love III (ranked 130th by Golf Predictor) won the Wyndham Championship on the US PGA Tour. The 51 year old American became the third oldest winner ever on the US PGA Tour with his third win at the event. In doing so, he replaced Padraig Harrington as this season's most unfancied winner and became the second most unfancied winner (after Derek Ernst in 2013) since Golf Predictor began in 2008! Our top ranked player, Brooks Koepka, finished well for tied 6th and we had ten of the top eighteen plus ties (10/25) in total. Jason Day (ranked 3rd by Golf Predictor) won the US PGA Championship on the European/US PGA Tour. The 27 year old Australian finally secured his elusive first major title with an assured final day performance. After a series of close calls in previous majors, Day built on his two shot overnight lead and was never in any real danger of being caught, despite Jordan Spieth's best efforts. Day finished with an impressive 67 (-5) to win by three shots from the young Texan. Our top ranked player, Rory McIlroy, finished in tied 15th in his comeback from his serious ankle injury. Overall, we had eight of the top eighteen plus ties (8/20) in total. The field ranking calculations on Golf Predictor have been adjusted to take the number of events played into account for the appropriate metrics. For metrics where a lower number is better (e.g. average position in current season/last five events etc. ), in the case of a tie, golfers who have played more tournaments will be ranked higher. For those metrics where a higher number is better (e.g. wins/top tens in the current season), in the case of a tie, golfers who have played less tournaments will be ranked higher. This is because in the former situation, it indicates more consistency and in the latter situation it represents a higher percentage. This is only fair, but it doesn't apply to the ranking of certain metrics, such as world ranking or performance likelihood, which remain unchanged. All data tables and charts have been updated to reflect this change, which will make the field rankings more accurate. Just another way to make Golf Predictor a little better! The predictions and statistics for this week, the US PGA Championship (European/US PGA Tour), are now available on Golf Predictor. Just the one tournament to cover this week, but it's a big one! It's the final major of the season and the PGA Championship heads to Whistling Straits for the first time since 2010. Let's hope Dustin Johnson doesn't ground his club in any so called bunkers this time around! It's the last chance for eight months for a golfer to land one of those prestigious titles, so that's probably why world number one Rory McIlroy has made a quicker than expected return from his ankle injury to tee it up this week in Wisconsin. 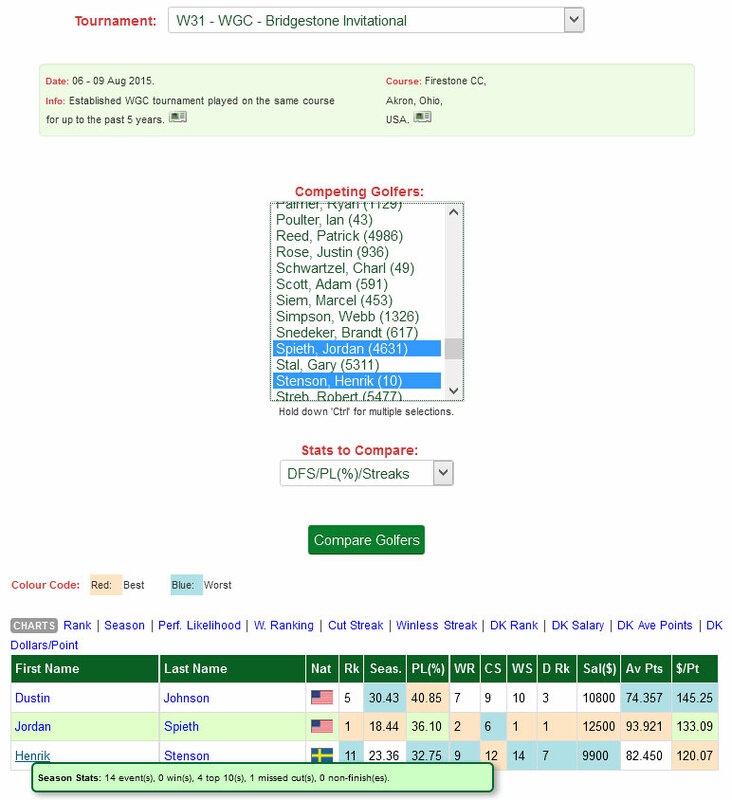 The season stats page for each golfer on Golf Predictor has been updated with a new table to show the best and worse round scores for the golfer in question in the selected season. This new table is similar to the one already on the golfer page for his entire career. As with that table, you can hover over the round value to see what tournament(s) the score was shot in. This is shown in the screenshot above, which shows a portion of the 2015 season stats page for Jordan Spieth. As can be seen, his season worst (at time of writing!) first round of 75 was shot twice, at the WGC-Cadillac Championship and The Players Championship. This new table should make these golfer Season Stats pages even more useful. Just another way to make Golf Predictor a little better! The predictions and statistics for this week, the WGC - Bridgestone Invitational (European/US PGA Tour) and the Barracuda Championship (US PGA Tour), are now available on Golf Predictor. It's the first of two weeks of big tournaments in the US this week with the WGC event as usual serving as a final tune-up for the last major of the season, the US PGA Championship next week. The second string Stableford event in Reno has to make do with only one golfer from the top one hundred in the world rankings as all the big names playing this week are teeing it up in Ohio.